Bear and Cubs cross stitch pattern... 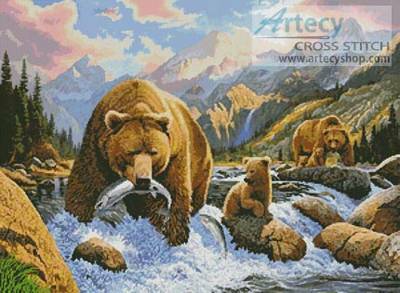 This counted cross stitch pattern of Bears and their cubs Salmon fishing was designed from the beautiful artwork of Chris Hiett. Original image copyright of Meiklejohn Graphics Licensing (MGL) www.mgl-uk.com. Only full cross stitches.